Accredited by the Nursing and Midwifery Council (NMC). 93% overall course satisfaction in the National Student Survey 2018. If you want a career as a qualified learning disabilities nurse, then we have a practical-centred course to ensure you get all the skills you need to become one. With job prospects for qualified nurses rapidly expanding, we have ensured that our course provides you with the knowledge and hands-on experience you will need to confidently meet the complex mental and physical health needs of both adults and children. So, whether you want to specialise in community learning disability nursing, forensic or secure settings, a hospice or in a residential setting, you'll be given the resources you need to follow your chosen path. Your academic knowledge will be boosted by a wide range of placement opportunities in Cumbria and Lancashire– which account for 50% of the course – providing you with the experience you need to make the transition from learning to employment. And, you have the opportunity to experience both city and rural healthcare systems, while networking and bolstering your employment prospects due to our close links with NHS Trusts and care providers. 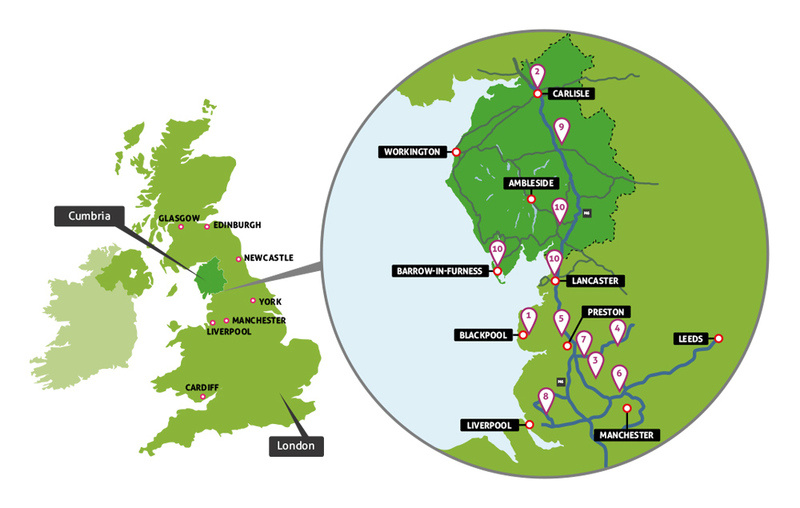 You’ll be living in a vibrant student city by the spectacular north west coastline, and, within an hour of the Lake District National Park and the big cities of Manchester and Liverpool. So, whether you want lively or leisurely, you’re within reach of both. Whether you are a college-leaver or a mature student wanting a career change, this course is your step into a rewarding career supporting the well-being and inclusion of people with a learning disability whether in the NHS, private or voluntary settings. That’s because we provide a real-world context for your studies to develop your independent thinking and problem-solving skills in preparation for a future as a learning disabilities nurse. You will finish this course fully-qualified to join the NMC Register, allowing you to practice as a nurse specialising in handling patients with learning disabilities. The need for qualified nurses is ever-expanding, so you can be confident that your qualification will open up many doors for employment. You'll also be ready to take on one of our post-registration courses to continue your professional development. Our course places an emphasis on nursing in a range of NHS, private and voluntary settings, including specialist community nursing teams, forensic settings, residential and special school placements. You'll learn how to work as part of a team which includes psychologists, psychiatrists, social workers, teachers, general practitioners, occupational therapists, speech and language therapists and healthcare assistants. Year 1 – You’ll get an introduction into the nursing profession, focusing on the skills you’ll need as a learning disability nurse – such as, health and behaviours and developing therapeutic approaches. Year 2 & 3 – You’ll build on these foundations and put the theory into practice with practical placements to ensure you get the very best, first-hand experience of working within a clinical setting – abroad should you choose it. 96-112 tariff points from maximum of 3 A-Levels. Also to include GCSE in English Language, Maths and Science (or relevant Social Science - Psychology, Sociology, Anthropology) grade C or above. Functional Skills Level 2 in Maths and English are also accepted. Successful recent study within the last 5 years at GCSE level or higher (NVQ3 accepted and NVQ2 not accepted). Pass Access to HE Diploma with 60 credits overall. Minimum 45 graded credits at Level 3 at merit. 96-112 tariff points from maximum of 4 Scottish Highers. 96-112 tariff points from maximum of 4 Irish Leaving Certificate Highers. There is intense competition for places on our learning disabilities nursing degree, so before you apply you should consider carefully if learning disabilities nursing is right for you. As part of the application and selection process you will need to demonstrate commitment to learning disabilities nursing. This means that your application will not be considered if you have applied to us for more than one field of nursing (or for additional professional courses other than nursing). In your personal statement you should demonstrate your motivation for choosing learning disabilities nursing, and reflect upon any practical experience you have gained. From 1 April 2015, all Higher Education Institutions delivering NHS training programmes will be required to assess students for their values using the core requirements set out in the Values Based Recruitment (VBR) framework. This assessment will take place as part of our recruitment process. Can I do a nursing degree on a part-time basis? Nursing programmes are undertaken on a full-time basis to ensure that students obtain enough placement time required by law to complete the degree. Support and help is available to students who may need advice on childcare facilities, transport or finance, please get in touch to find out how we can support your individual needs. How many placements will I have to do and where will they be located? 50% of the programme is in clinical practice being supervised and assessed by clinical staff. Placements are located throughout Cumbria and Lancashire. If you have a placement in the south of the county we can help with accommodation on the Lancaster campus. We can also help with transport to placements - get in touch to find out more. I haven't been in education for a number of years. Will I get support with adapting back in an educational environment? Yes, our student support services are at hand to help you every step of the way. Plus nursing lecturers will work through any areas you feel unsure about. We also offer ‘Headstart’, which is an online information service for you to start your degree feeling confident. Apply online through the Universities and Colleges Admissions Service (UCAS). The primary application period is between September and January, and all applications received by 1 January will receive equal consideration. Applications submitted after this date may still be considered, however the course you have applied for might be full by this time. If so, we may consider you for alternative suitable courses. International students should also apply through UCAS. Please see the international pages of our website for country-specific entry requirements, including English Language requirements, as well as contacts for advice and support. When we receive your application, we will send you an acknowledgement and if you are successful at this stage you will get an invitation to interview on a particular date. If we are not able to offer you a place on your chosen course, we will usually try to offer you a place on a similar course and will contact you to discuss this. Alternatively, if we think you are suitable, but cannot offer you a place on your preferred campus because of the level of competition, we will offer you a place at another campus if one is available. Once you have accepted your place, the admissions team will contact you and send further information from February onwards about accommodation, and from May/June onwards about preparing to join the university. I absolutely love placement and I am always excited to get back out there. I have been lucky in that I've had some amazing placements that have given me fantastic opportunities. The best will be my elective placement in June/July when I go to Australia to work with people with learning disabilities. I am very excited about that!